Rabbit is often thought of as the hardest peak on the DPS List, but you can get around that by adding half a day and camping on a nice ridge with really great views! The map shows the trailhead 80' below sea level, so I reset my altimeter and left the car at 240pm. The late start was planned to avoid the heat of the day, and I had climbed Eagle that morning to fill the day. From the somewhat isolated and unsafe-feeling-like-maybe-I'm-trespassing trailhead, I walked up over the levee, turned right and followed the channel west. Very loose sand made this unpleasant, but there is a farm road on the levee where the footing is far better. Pickups were using that road, but I have no idea what they thought of me any my backpack. 0.4 miles west of the levee gate, there is a fork in the drainage channel (waypoint RABA01). I stayed left to continue west, but after a short distance I got past the orchard to my south, and turned southwest. Leaving the channel, I found an old road (waypoint RABA02) where the walking was very easy. The road wanders a bit but basically goes southwest through very jumbled terrain where cross-country boulder hopping would be quite slow. Any reasonable 4WD vehicle could drive this part, but I'm guessing it's not legal. A ducked trail marked by a 2" steel pipe leaves the old 4WD road (waypoint RABA04) one mile from the trailhead and just above sea level. Calling this a trail might be stretching it. There are lots of ducks, some of them contrasting white on the dark desert varnish of the boulders, but it's really a ducked cross-country route rather than a trail, and it might be hard to follow in the dark if you were unfamiliar with the route. I've included lots of waypoints so you can get back on track! 0.3 miles later, the ducked trail crosses an old dirt road at an orange stake (waypoint RABA05). Don't be fooled by that road! Cross it, and continue following the ducked route southwest. The trail continues through a boulder field that would be brutal to pick your way through without the ducked route, approaching the wash line on the USGS map but staying northwest of that line. At the 440' contour (waypoint RABA07, about 2 miles from the trailhead) the trail comes up out of a wash and the walking gets far easier. There is almost a mile of good walking, up on a rib, with lots of ocatillo but no boulders or brush to deal with. 3.2 miles from the trailhead (waypoint RABA10) there are many ducks for some reason. This is a good rest stop, with huge flat boulders to lounge on before the climbing starts. The route has only climbed 900' in 3 miles from the trailhead, but the fun is about to start. 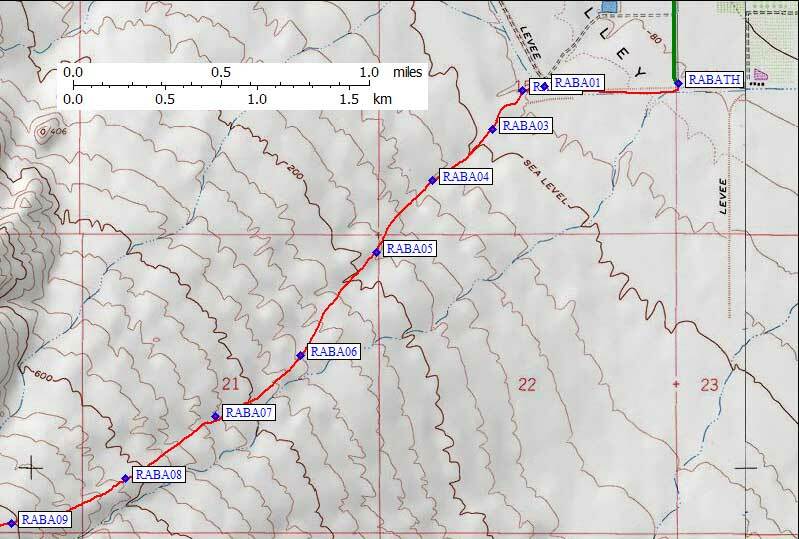 At the 1000' contour (waypoint RABA11) the ducked route turns left abruptly and goes up onto the ridge. It had been pretty hot getting this far, even in early March, but fortunately for me the sun went behind the mountain at 5pm just as the trail steepened. Just above 1.3k there is switchback (waypoint RABA12), proving this was a constructed trail built up for a constant grade. It has fallen into disuse and disrepair, but there are clear signs in this section of a well-built trail. Rather than following the ridge, the trail coutours south before rising to the ridgeline just above 1.8k (waypoint RABA14). 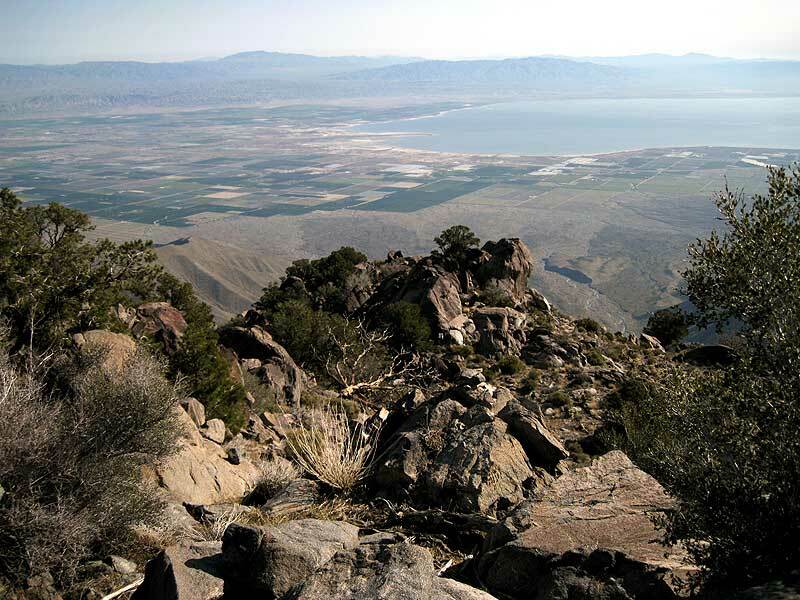 There is a campsite here, limited in size and exposed to the wind, with a huge view of city lights and the Salton Sea. It's definitely worth hauling your water up here just to watch the sun set and the lights come on. I dropped my pack and made a phone call around 530pm, then made dinner as the warm wind died down. I left camp at first light the next morning, after killing half a dozen mosquitoes during breakfast. That seems wrong, mosquitoes on a dry ridge in the desert! I followed the old trail (now on the northwest side of the ridge) going up but I ran the ridgeline coming down. The ridgeline is WAY better! It is some of the best walking of the entire trip. 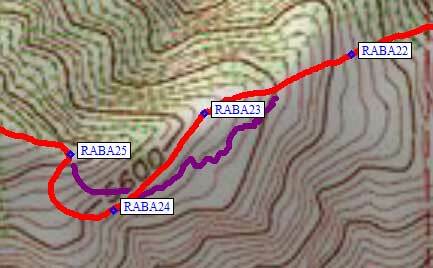 The two routes meet both at the campsite (waypoint RABA14) and at the 2.6k saddle (waypoint RABA15). Don't be fooled by the ducks at that saddle going down. Stay on the ridgeline to 1.8k elevation. The sun rose on me as I dropped 50' to the saddle, then climbed 200' very steeply on the other side. I saw no trace of any use trail above that sharp rise (waypoint RABA16), although there were several lines of ducks through the Agave. At the top of this rise, drift left following the ducks to minimize Agave detours. (I came down a more direct line that was not as fast.) I passed just south of Point 3235 (waypoint PT3235) where the Agave eased up a bit. There were at least three lines of ducks to follow, proving that there are more ducks when you need them the least. There were some small cleared spots on the shoulder (near waypoint RABA20) where people had camped next to huge boulders. They were spread over 100 yards, not clustered, but quite a few people could camp on this shoulder. This would be a much higher camp, but I'd hate to carry a full pack this far. The lower camp is far enough to keep summit day within reason, so camping higher would just be for the experience. Old campfire rings here, with bushes growing out of them, indicate people used to find or carry firewood. I followed the left edge of a face until it became a rib at 3.7k (waypoint RABA21), then stayed to the right (north) side of the rib to go around some rocky points. Around 5.1k (waypoint RABA22) there is a bit of a flat spot, with many rows of ducks. There didn't seem to be an obviously best route here, but I drifted left and climbed to a larger ridge. On the way down I took the purple (lower) line, and got caught up in huge boulders that slowed me down. 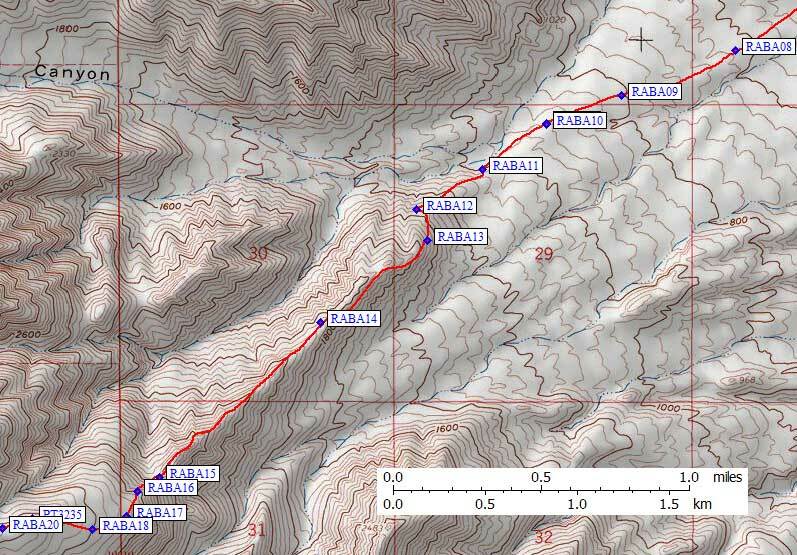 The best line seemed to be a traverse left at 5.5k (waypoint RABA23) below a big cliff face. You can angle up into the first break in the cliff, but it's better to drop slightly and go further around (waypoint RABA24, the red line) for easier terrain. Head north to the shoulder at 5.8k (waypoint RABA25), then turn west and follow the ridge toward the peak. Looking down from the 5.8k shoulder. There is a lot of brush to dodge on the summit ridge, but not much of it has to be pushed through. I reached the 6640' summit of Rabbit Peak at 1030a, about 5 hours and 4800' gain from camp, There were only very small patches of snow left, in contrast with several feet of snowpack a few weeks earlier, so I stuffed a couple of water bottles and packed them in a sweater for the hot hike out. I briefly got a cell signal, but it was unreliable and the call dropped. This register has an astonishing level of bragging about how fast people were! And then there's Doug Mantle, who's climbed it 23 times and doesn't really need to brag. I spent an hour on top, took 3 hours getting back to camp, packed up, and spent another 2 hours getting down to my car. My altimeter accumulated only 65' of gain coming down from the peak, so it's pretty much a straight 6700' of climbing from the car to the top, 16 miles round trip. Camping 4 miles in makes summit day reasonable, and I had hours of extra daylight in March.